The other day my best friend and I were having a conversation about the Video Music Awards (VMAs). She mentioned that last year the artist Pitbull got slammed on twitter for speaking Spanish during his MC duties. Now, I was not aware of this because although I saw various performances on YouTube, I did not watch the awards when it aired. I got online to see if I could read some of the things that had been written about the incident. I found lots of tweets filled with people’s displeasure saying things like “Pitbull isn’t even American, why is he speaking Spanish on an American awards show?” Others were saying equally ignorant things such as, “don’t those people already have their own award show?” What took the cake for me was this quote: “English and Spanish are the top languages. I speak no Spanish because I wasn’t exposed to it. However, I want to learn their language too. Let the Spanglish flow. Sure beats Ebonics.” I couldn’t believe that someone was defending one culture that came under attack and in the same breathe was insulting another culture. Acknowledge your customers: Greet them cordially, do not eye them suspiciously when they enter your establishment. If you do not speak the local language well and feel self-conscience about caring on a conversation, learn one or two greetings. Give them a genuine smile at the very least; a smile will go a long way. If you are busy and cannot attend to them at the moment, say so and let them know that you will be with them shortly. If you are having a personal conversation, end it and attend to your customers at once. Above all, never leave your customers thinking that you do not what to help them. Do not discuss your customer’s/client’s issue in another language in their presence to another individual: It is rude to have a conversation with your customer and then switch languages to include another individual into the conversation. If you have to ask a fellow employee to help with your customer’s inquiry and that fellow employee does not speak your customer’s language, briefly explain to your customer that you must ask another individual and apologize for having to switch languages. Periodically stop and summarize for your customer what was said. Do not make any gesture, remark, or expression that might make the customer feel as though you are saying negative things about them. Familiarize yourself with local customs: If your culture is different from that of your customers, you owe it to your business to get to know the culture. Knowledge of the local customs will prevent you from making mistakes and alienating your customers when dealing with them. For example, placing money on the counter shows good manners in one culture but may be seen as rude and standoffish behavior in another. Not looking someone in the eye when speaking to them is considered a sign that you respect them and are not challenging them in one culture but that you are dishonest and unsure of yourself in another. Always Smile! You will want to make it part of your company policy to smile while you are serving your customers, especially if they are American. Americans are put off if they feel that you are not taking pleasure or pride in doing business with them. VMA viewers, whether warranted or not, felt left out. When your customers walk away they should never feel left out. You will find that your customers do not mind that you follow your own cultural customs or that you converse in your native tongue at work. All they want from you is the benefit of your expertise, your attention, your assistance and your appreciation that they chose to conduct business with you. Did I leave something out? Share with us your customer service experiences. 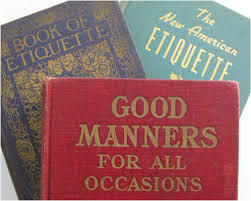 What advice on customer service etiquette would you give? Please comment below. By translationsbyrachel in Uncategorized on December 17, 2014 .